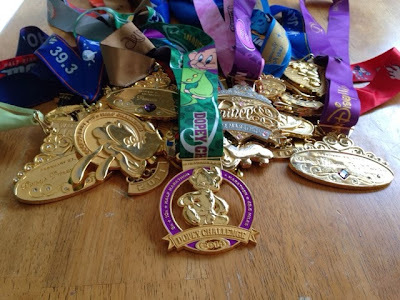 I've been home now for almost a week from Walt Disney World Resort and I've been thinking about all of the millions of posts that I want to post about Dopey Challenge. First, let me just say... THAT was fun. All 48.6 miles were just fun. I never felt like it was a chore or a dread. Just fun. In fact, it was so much fun that I'm left feeling a little sappy, sentimental and sad all at the same time now that I'm home. 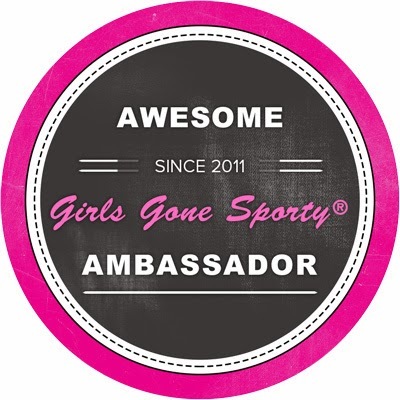 When I first started out on this little thing that I like to call "what I do" now, I never realized that the races, medals and experiences would mean so much to me. I really just thought. "Cool. I'm going to run a Half Marathon at Disney." Oh so not the case....I've met SO many friends along the way, had so many good times and have gotten to share so many memories with my mom and sis. Really. No one could have prepared me for that. As I brought home all of my medals...yes, all six fabulous medals, I got a little teary-eyed putting them with their rightful family members. Yeah yeah yeah, I know this absolutely sounds like the writing of a crazy woman. Maybe so. I've had the crazy thoughts in my head that one day all of these medals will be left to my kids. Talk about morbid. OH GAH. It is morbid. But it's the truth. Here's the thing...I have three children of whom I love with every fiber of my being. My favorite hobby is running. We are a family who loves all things Disney. One day when I'm long gone, they will look back at all of my pictures and all of my medals and hopefully know that I loved every single mile. No PR's, no hopes of being an elite athlete..just their Mom doing what she loved. Every race bringing home a different medal with thousands of pictures and stories along the way to show it. Please bring on the magical Kleenex. I can't take it. I look back at all of the pictures that I have of my mom, sis and I at the start, finish lines and playing in the parks during all of these races and I realize that I could not be any more blessed than this. Seriously. I might just be the luckiest girl in the world. Me, Mickey, My Mom and Sis after the Inaugural Minnie 10K! My kids have grown up with me running Disney races so it is what's normal in their world and honestly, I wouldn't have it any other way. I love having them run with me too, it's just not always easy to do with school, finances etc. and sometimes I just enjoy running with my mom, sis and girlfriends. I can't wait until they are old enough to run the long distance races with me and create their own race weekend experiences. 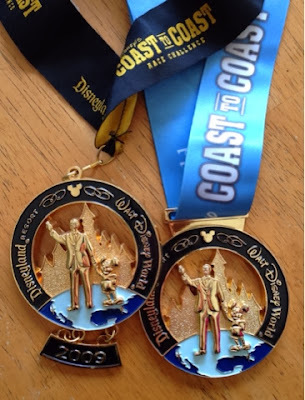 I will be the blubbering Mom fool the first time I see them cross the finish line of their first Half or Full Marathon at Disney. Oh help me now. Running with my kiddos through World Showcase! 1. Be Thankful, Grateful and Content in all that you do. 2. Run because you love it, not because it's the "in" thing to do or for what others think of you. 3. 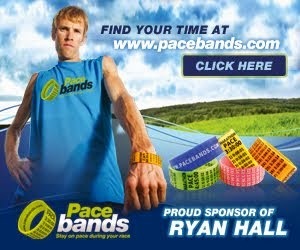 Run your own race. You are your own person. 4. Train hard. Play hard. Accept your rewards graciously. 5. Pay it forward. Encourage others along the way. Others have encouraged you. 6. Family, friends and relationships are the most important. Don't lose sight of that. 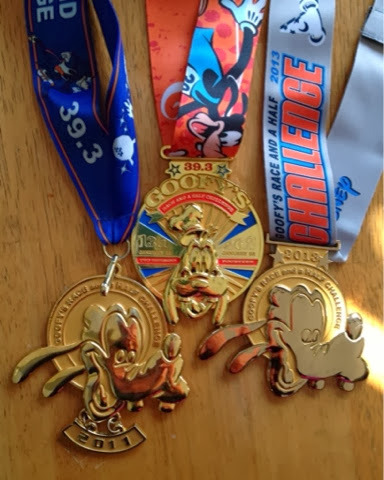 So yes, I'm collecting race medals that I can proudly pass on to my kids. 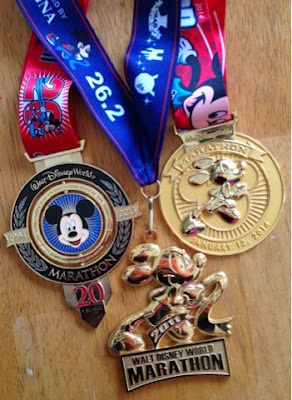 I can't wait to tell my grandkids all of the many stories behind each medal. I know this is a little deep coming from me...I'm the biggest goof on the planet. That's okay. I've got lots of posts coming "re-cap style" with lots of funnies in them. But as for now, I will leave you with pictures of some of the pics of my medal collections from Marathon and Princess Weekends....I've got at least one more Coast to Coast and two Dopeys in my future! 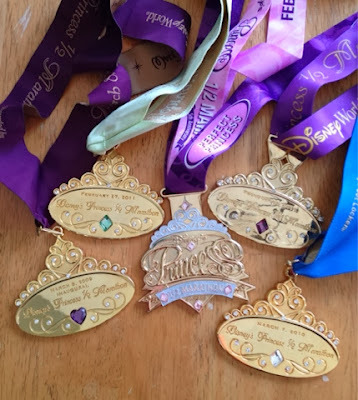 And the Princess medals...oh yeah, I'm going to be running that race until it's not in existence anymore so the grandkids are going to have alot of fun with those jewels. 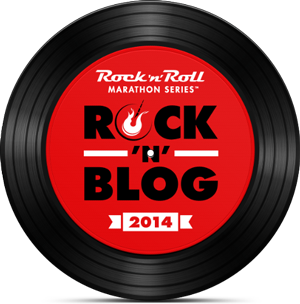 Thanks for reading my sappy post...Happy running and see you at the Castle! 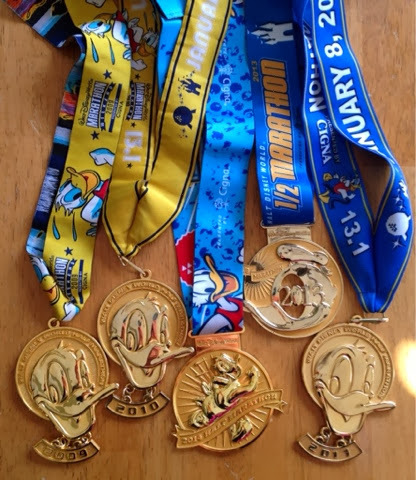 **What do you do with your race medals? runDisney Family Fun Run 5k...3.1 Miles of FUN! Pinterest Recipe! Happy New Year!